Find and enter restaurant wait times and seating status nationwide! Ever wonder what the current wait time is at your favorite local restaurant? 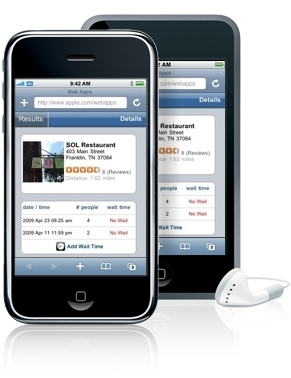 Now you can use this user generated web application on your smartphone, mobile device or computer to search and enter what the wait time is at any restaurant across the nation. Simply enter the type of food your in the mood for or restaurant name, enter the city and state, tap search and a list of restaurants will be displayed. New Twitter account which allows additional flexibility in the search and enter process of researching wait times! You can follow us here. Or you can tweet the current wait time of any restaurant to @whatsthewait. Wait times are easily searched for and entered on the go from your iPhone or Mobile Phone. Read reviews for each restaurant provided by Yelp.com. Tap the Call button and instantly be connected to the restaurant or location. Tap the Map button and use the built in Google Maps application to get directions to each restaurant or location. Avoid the wait altogether by making instant online reservations through the Open Table website using your iPhone. (if applicable) . Meeting a group of friends for dinner? Email them restaurant info and a map link of how to get there with the click of a button! You can now track all of your wait time history using your email address. See total wait by week, month and total.